The Wolseley regards the Florentine as “the epitome of an indulgent biscuit” and its own Florentines certainly live up to that standard. Handmade in Devon especially for the grand cafe, each biscuit brings together flaked almonds, hazelnuts, sultanas, citrus peel and stem ginger in a delightfully chewy and crunchy combination, topped with a delicious layer of salted caramel chocolate. 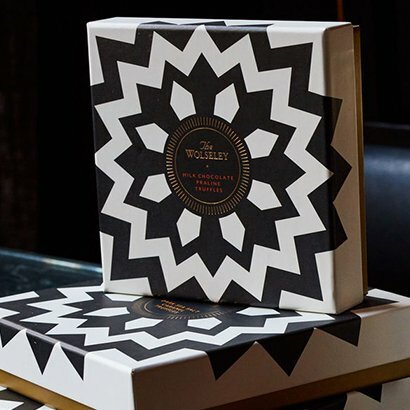 Each black, white and gold tin contains eight biscuits – the perfect accompaniment to afternoon tea. Allergens: May contain traces of Milk, Nuts, Egg, and Gluten.